Photovoltaic (PV) modules contain both valuable and hazardous materials, which makes their recycling meaningful economically and environmentally. The recycling of the waste of PV modules is being studied and implemented in several countries. Current available recycling procedures include either the use of high-temperature processes, the use of leaching agents or a combination of both. 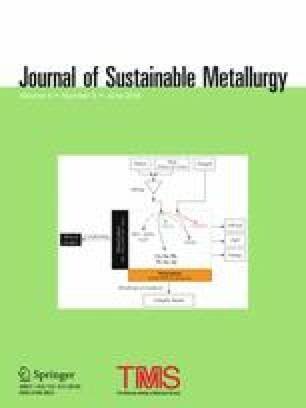 In this study, waste of silicon-based PV modules are separated using an electrostatic separator after mechanical milling. An empirical study is used to verify if the separation works and to select and fix several parameters. Rotation speed of the roller and DC voltage are evaluated as a result of the separation of metals (silver and copper), silicon, glass, and polymers. The efficiency of metals’ separation is determined by acid leaching of the corresponding fractions followed by inductively coupled plasma optical emission spectrometry (ICP-OES); that of polymer separation is determined by mass difference due to combustion of the corresponding fractions; and those of glass and silicon quantities are determined by X-ray diffraction (XRD) followed by characterization using Rietveld quantitative phase analysis (RQPA). It is shown that the optimal separation is obtained under different operating voltages of 24 and 28 kV and a rotation speed of 30 RPM or higher. Furthermore, it is shown that there is no significant difference among the tested parameters. Results provide a new option in the recycling of waste of silicon PV modules that can and should be optimized. The online version of this article ( https://doi.org/10.1007/s40831-018-0173-5) contains supplementary material, which is available to authorized users. The authors are grateful to Capes, CNPq, FINEP, and FAPERGS (Brazil) for their financial support.